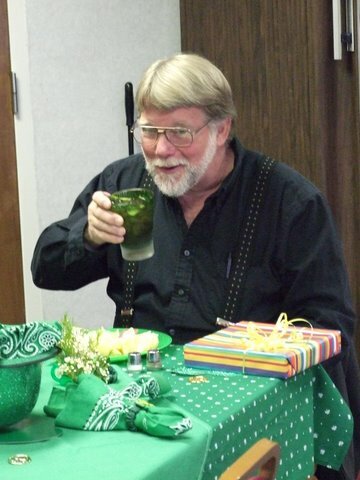 Tim Ryan did not drive snakes out of the Murphy Library on St. Patrick’s Day. He threw a party for the librarians. Ryan, a resident artist at the John C. Campbell Folk School, had the winning bid at the 2009 Friends of Murphy Library Auction and landed a dinner party to be given by Sue Ellen Woodward. 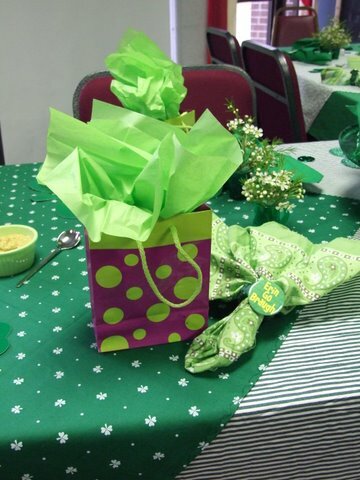 Then he made the party a gift to the Murphy Library staff. 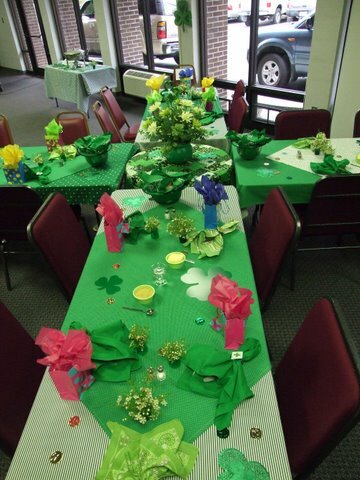 The staff of Murphy Public Library enjoyed a St. Patrick’s Day feast courtesy of Tim Ryan, resident artist at the John C. Campbell Folk School. 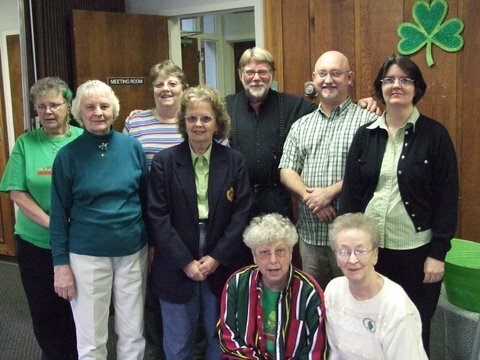 Front row (l to r): Norma Smith, Lois Lenz; middle row: Evelyn Glidden, Ruthie Gentry; back row: Lizz Anderson, Charlene Davis, Tim Ryan, Jeff Murphy, Melissa Barker. 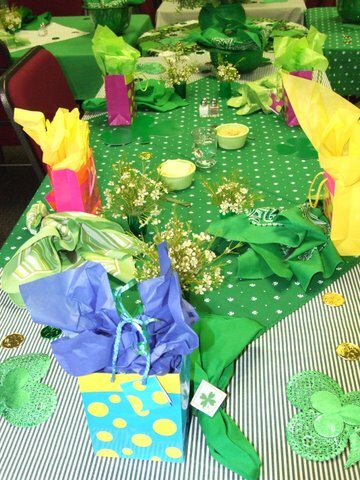 The meeting room at the library is decked out in its St. Patrick’s Day finest. 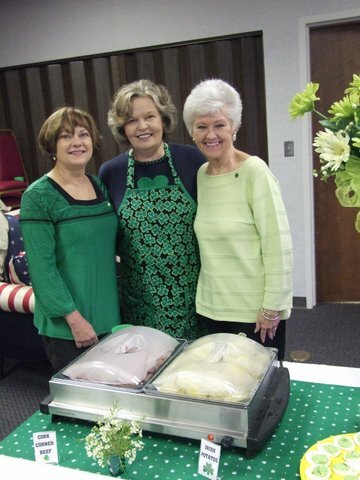 Bonnie Allen, Sue Ellen Woodward and Sondra Bell are the consummate party-organizers who transformed the Murphy Library's meeting room for St. Paddy's Day. 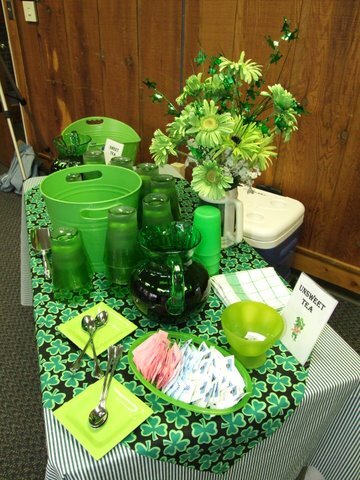 Bonnie Allen, Sue Ellen Woodward and Sondra Bell helped transform the meeting room into a leprechaun’s lair and served up, what else, corned beef and cabbage, along with other Irish treats. 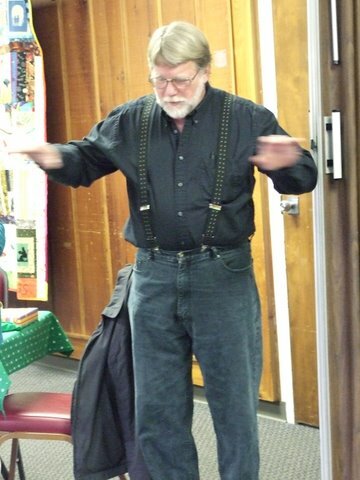 And many thanks to the Nantahala Regional Library staff who worked the front desk. are welcome to attend. The event starts at 11:00. The event is free. The meeting room wall in the Murphy Library that was an “eeew” off white last week is now a sparkling “Friends’ Blue” this week. The work started with the professional services of Bob Smith, a local painter who donated his time priming the wall on Friday. Then came Monday, the day of reckoning. Youth Services Librarian Sarah Arnaudin and her friend Emilie Jones took on the wall. Emilie is one of the moms who brings her two wonderful children, Gates and Liam to Storytime. 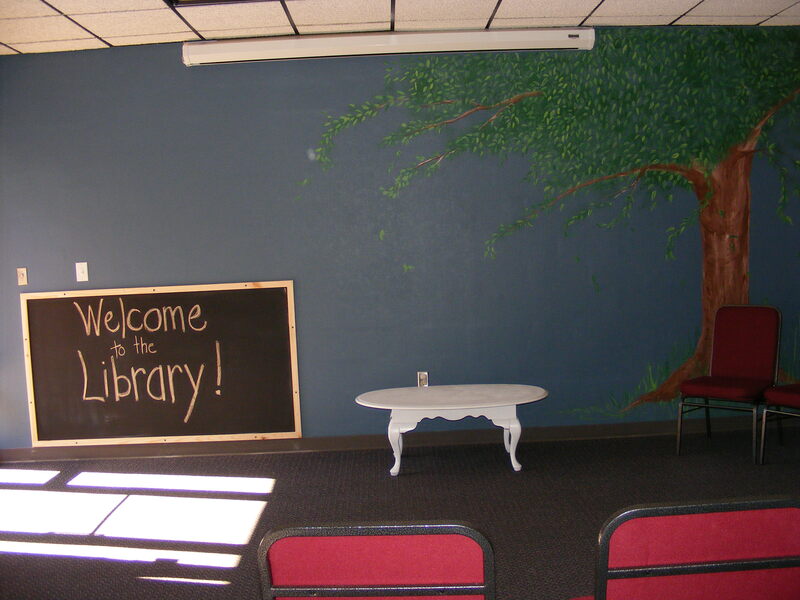 In fact, it was Emilie who suggested the wall could be a show-stopper at Storytime with just the right shade of paint. As we volunteers know all too well – no good suggestion goes unpunished. Here are the results of the day. Even I coudn’t resist picking up a brush. And finally, the blue was on the wall. Then Emilie took out her saw, put on her safety glasses and went to work on The Blackboard Project. She and Sarah measured and cut a board to cover with blackboard paint. It will be installed at child height and Sarah can write out the weekly Storytime theme for all the children to see. Everyone played well and there were no fights. Meeting room to get a makeover! What are they looking at! These children and their favorite librarian Sarah Arnaudin are pointing at the poor condition of the wall behind them. But not to worry, the painters are coming. And the looks that say “eew” will be replaced with smiles of glee.